Six days since the Holy See began tackling Crisis 2.0 in earnest – and amid an epic, months-long storm for the US' longest-serving diocesan bishop – at Roman Noon this Friday the Pope granted the retirement of Cardinal Donald Wuerl as archbishop of Washington, nearly three years after the capital prelate reached the canonical age of 75, and after weeks of public candor on his wish to be released from the role. 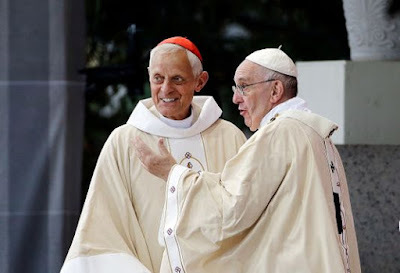 At the same time, in a uniquely personal way, Francis has designated Wuerl – who'll turn 78 next month – as apostolic administrator of the 750,000-member fold spanning the District and its Maryland suburbs pending the Pope's choice of his successor, which isn't expected to come for at least several months, most likely in the New Year. While prior speculation saw the cardinal's resignation coming in tandem with the appointment of another prelate as the DC church's interim head to allow some "breathing space" from the roiled scene in the wake of twin controversies over abuse and the handling of cases, as Rome's chosen caretaker, Wuerl will unusually retain the full powers of the archbishop during an open-ended vacancy; under normal circumstances, a departing bishop is only named administrator once his successor has been chosen, in which case the transition only lasts two months. In the temporary role, the cardinal – who hasn't made public appearances over the last month – is likely to carry out some degree of deck-clearing in terms of difficult calls, so that the next archbishop won't be saddled with making tough or unpopular decisions at the outset of his tenure. 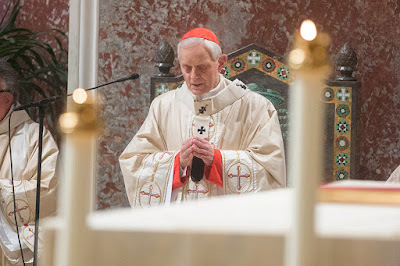 As for the process itself, here it bears recalling how it wasn't until the final weeks of then-Cardinal Theodore McCarrick's succession in early 2006 that Wuerl – then nearly two decades in as bishop of his native Pittsburgh – surfaced as a contender for the capital seat. Along the same lines, as the state of the DC archdiocese has been upended by McCarrick's historic June downfall amid allegations of sexual abuse of minors, alongside revelations of a history of harassment of seminarians and young priests – then compounded by the bruising fallout of Wuerl's presence in August's Pennsylvania grand-jury report on abuse in the state's six dioceses, led by Pittsburgh – the standard consultation is expected to run deeper than usual, with a priority for a healer added in to the already formidable need both for a pastor who can unite a bitterly polarized fold, and a sound administrator able to plan for the ongoing, almost staggering growth of what's rapidly become one of US Catholicism's most energetic and diverse outposts, which'll soon be twice the size of the church Wuerl himself inherited a dozen years ago. 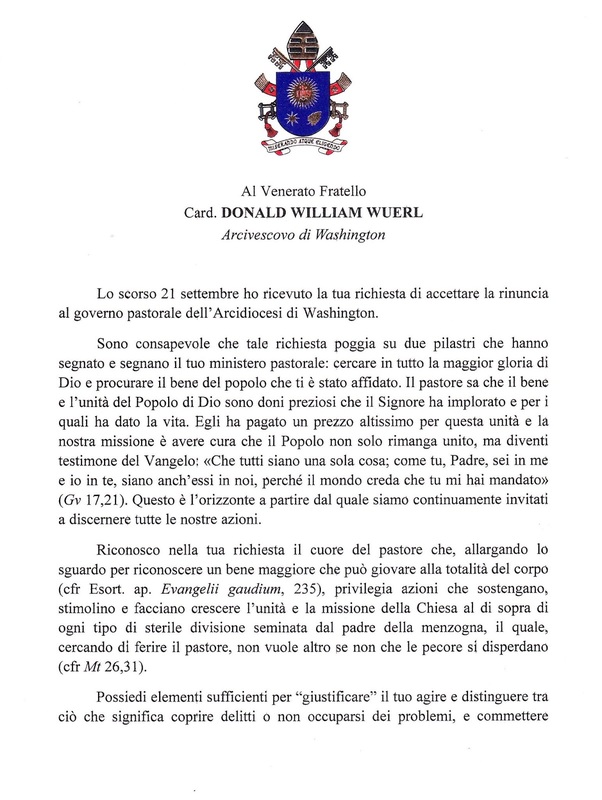 Having released his own letter to the faithful repeatedly begging forgiveness for his own lapses and those of church leadership, the day's even more notable missive was the one Wuerl received: an extraordinary personal word from Francis – a practically unheard of gesture by a pontiff on the resignation of a prelate, let alone one under the shadow of a crisis, but nonetheless a striking sign of the Pope's enduring regard for his close confidant. 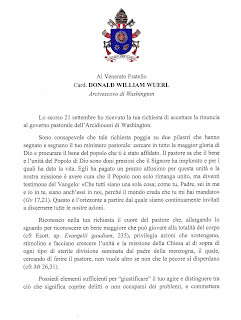 On September 21st I received your request that I accept your resignation from the pastoral governance of the Archdiocese of Washington.